Ever since the Triangle Complex Fire ravaged parts of Orange County last Fall I have been trying to make time to photograph it’s aftermath. This past weekend I did just that. I took a drive down to the Santa Ana River Trail which parallels La Palma Street in the Yorba Linda/Anaheim Hills area. Bryan and I have ridden our bikes on this trail many times and I frequently drive by it on my way home from the chiropractor so I have seen the devastation before. 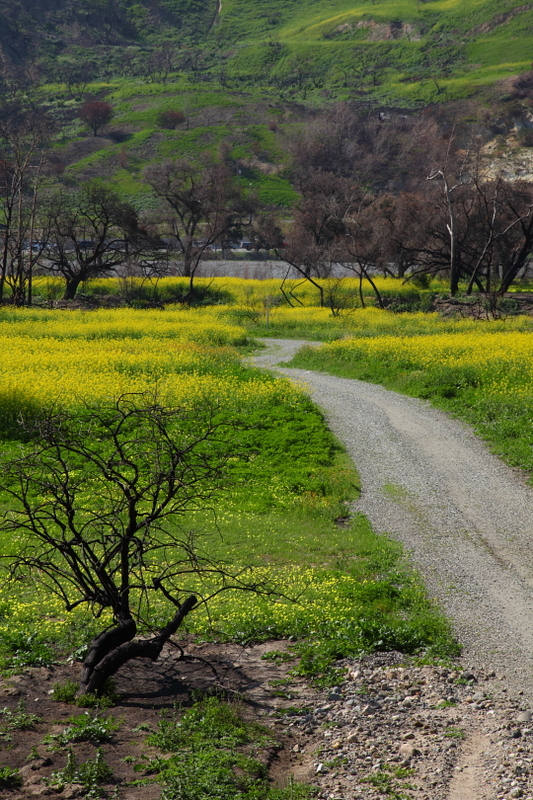 The burn areas, which extended into Featherly Regional Park, seem to be recovering quite nicely. I’m actually glad I waited this long to photograph the burn areas as spring is just around the corner which has brought new growth. I love this week’s photo because of the stark contrast between the badly burned trees and the beautiful wildflowers that surround them. I took many photos this day so not only am I posting a photo here I’ve also posted all the photos I took in the gallery. This trail by the way, is amazing; great for cycling, running or even leisurely walks. It has an abundance of colorful wild dandelions growing along the path which you can also see in the photo gallery. Photo Info: Shot with our 5D Mark II, ISO 200, F11 at 1/250 of a second.